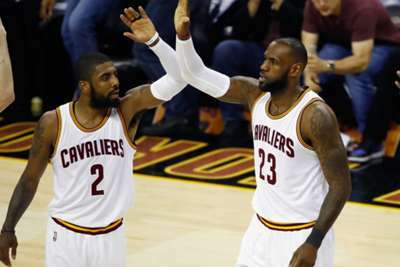 LeBron James and Kyrie Irving did not fall out during their time together at the Cleveland Cavaliers, insists the team's former high-performance director Alex Moore. Four-time NBA MVP James returned to the Cavs in 2014, having won two titles with the Miami Heat after initially leaving Cleveland in 2010. Irving was drafted by Cleveland while James was in Miami and, although the pair linked up to win the 2016 championship, reports in recent months have claimed that the duo, who have both now departed, did not get along as team-mates. Boston Celtics point guard Irving allegedly claimed the Cavs did not need James before the two clashed, but Moore, who spent six years in Cleveland, says there were no issues between them. "There was no falling out. I think that's more media talk," he told Omnisport. "The locker room was totally fine. [Irving] just wanted to go in another direction." And Moore credits James, now of the Los Angeles Lakers, with inspiring Cleveland to their first championship, describing him as a "great team-mate". "When he came back, the entire place changed. The emphasis went on winning a championship," Moore said. "He's so professional and he's such an unbelievable athlete that, when he came back, everybody was just driven. There was this feeling that, 'We have to win this, we're going to do everything we can'. "The way he displays, on and off the court, is such a great example that everyone else falls in line with what he's doing. "It's nice to have a LeBron on your team. In basketball, you need superstars. There's only five guys on the court. "If you look at the history of who has won the NBA in the last couple of years, you definitely need those big-name players. LeBron's a great team-mate. He's probably the best player ever."